Trump Makes Bid For 'More Transparency' In Hospital Charges To Insurers : Shots - Health News A little-noticed Trump administration proposal would require hospitals, doctors and insurers to post the true, negotiated price for a medical procedure or service, as opposed to the "list" price. The Trump administration aims to boost competition among hospitals and cut costs by letting consumers see how widely prices can vary for the same medical or surgical procedure. But health economists say patients typically have little choice in choosing their hospital. HHS tucked two questions about publicizing the negotiated prices into a separate, 187-page provisional rule released earlier this month that governs health care information technology. The Wall Street Journal reported on the idea last week. "The availability of price information could help increase competition that is based on the quality and value of the services patients receive," HHS argues in its proposed rule. "The Department is considering subsequent rule-making to expand access to price information for the public, prospective patients, plan sponsors and health care providers." Zack Cooper, a health economist at Yale University, says he's skeptical that this particular attempt at price transparency would reduce overall spending on health care. "Most consumers don't look at the price of health care services before they access care," Cooper says. "So I think we need to understand that most folks are not going to, all of sudden, go Googling hospital prices and then make big changes as to where they [go for] care." Still, Cooper's research suggests HHS is looking in the right direction. In a paper he published last month in Health Affairs, in which he analyzed the prices negotiated between hospitals and insurance companies, Cooper found that most health care inflation comes from rising prices for hospital care. "By and large, physician prices haven't gone up in the last 10 years," he says. "In contrast, we've seen pretty remarkable growth — on the order of 5 percent per year — in hospital prices." Those high prices end up in insurance premiums, which have also been rising, Cooper says. The American Hospital Association is opposed to making its negotiated prices public. "This isn't really what consumers need or want," says Tom Nickels, the AHA's executive vice president for government affairs. "What consumers need and want is 'What are their out-of-pocket costs?' 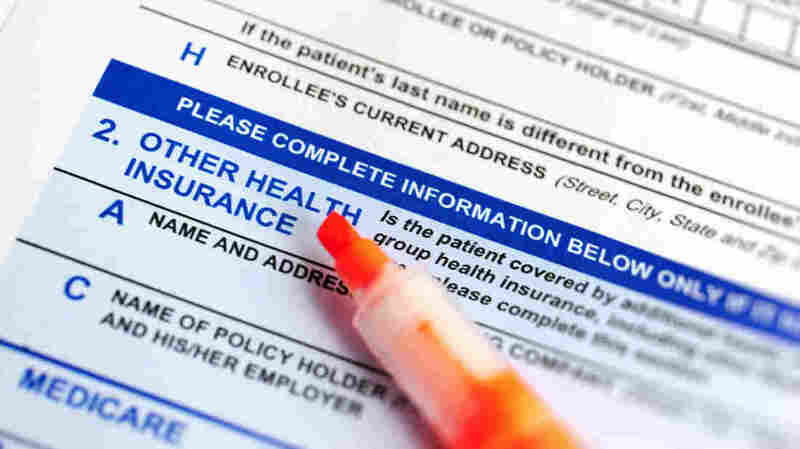 "
Almost 60 percent of people with employer-sponsored health insurance carry plans with deductibles of more than $1,000. That means more people are exposed to high health care charges for hospital visits. In addition, patients complain frequently of surprise bills they receive after a hospital stay. Those surprise bills often arise when a patient is treated by out-of-network doctors who happen to be working in hospitals that do participate in the patient's insurance network. Nickels, the representative of the hospital association, says consumers have no need to see the prices insurance companies pay hospitals, just as they don't need to see what a grocery store pays for cases of Coca-Cola. But a glance at the public comments posted on regulations.gov suggests members of the public don't agree with him. The agency argues in this proposal that the complexity — and opaque pricing in the health care system — make the system less efficient and hurt patients' health. "Enough with the secrecy and back room deals," writes one commenter. Another writes: "When we purchase groceries, cars, homes, airfare, hotel rooms, etc., we know the price before we buy. Shopping around of lower prices is easy. The glaring exception is health care." In contrast, Nickels argues that revealing the secretly negotiated deals would actually cut competition. And he questions whether it would be legal. "We have a system that basically allows people to have private contracts between each other in an economy," he says. The hospital price proposal is the latest in a series of efforts by the Trump administration to boost price transparency in health care. In the past few months, HHS Secretary Alex Azar has proposed several rules to make drug prices more transparent and to change the system for negotiating those prices. The first would require drug companies to include the list prices of their medications in any television or magazine ads promoting their drugs. Another proposal would tie the price that Medicare pays for many cancer and arthritis drugs to the prices other countries pay for those medications. Finally, the agency wants to upend the entire system for pricing prescription drugs that people buy at their local pharmacy. Right now the prices of those medications are determined by negotiations between drug companies and middlemen known as pharmacy benefit managers who negotiate discounted prices on behalf of insurance companies. But those discounts come in the form of secret rebates — and the pharmacy benefit managers keep a share of those rebates for themselves. Now HHS wants to make those rebates illegal and force the players to negotiate discounts upfront. Sara Fisher Ellison, a health care economist at MIT, is pessimistic that these proposals will reduce costs in the prescription drug market. "They're trying to, around the edges, improve the function of the market," she says. "But to be honest they probably missed the mark. That's because the market for pharmaceuticals is not like a standard market." She says the problem is consumers don't have the power to easily switch to a competitor product if the drug they're taking has a high price. "In pharmaceuticals, the end consumer — the patient — is not the only decision maker, and in fact is often not even the most important decision-maker," Ellison says. In reality, she says, it's the insurance companies and the doctors who decide what drugs a patient gets, and often what hospital a patient goes to. And those are the people who are already negotiating the price.